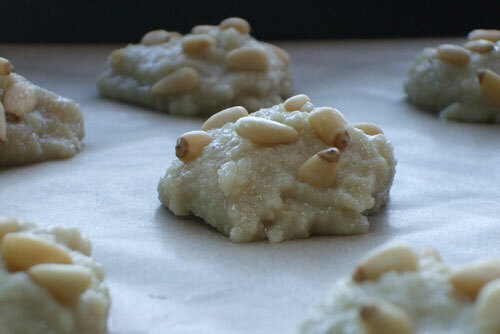 Alchemy in the Kitchen: Pine Nut and Almond Macaroons – and not a pink poodle in sight! 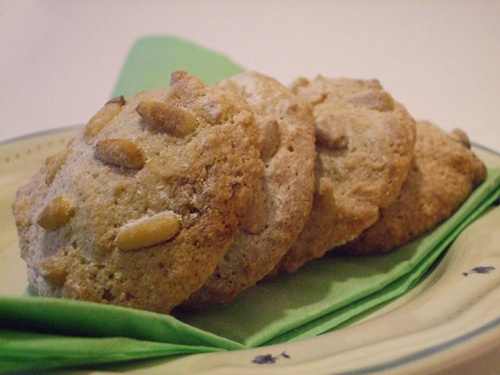 Pine Nut and Almond Macaroons – and not a pink poodle in sight! When I think of macaroons, the first image that comes to mind is of the currently fashionable Parisian version available in a variety of pastel shades and exotic flavours. For me they are the confectionery equivalent of the pampered pink poodles you find trotting along the Promenade de la Croisette in Cannes, looking over-primped and more than a little absurd. 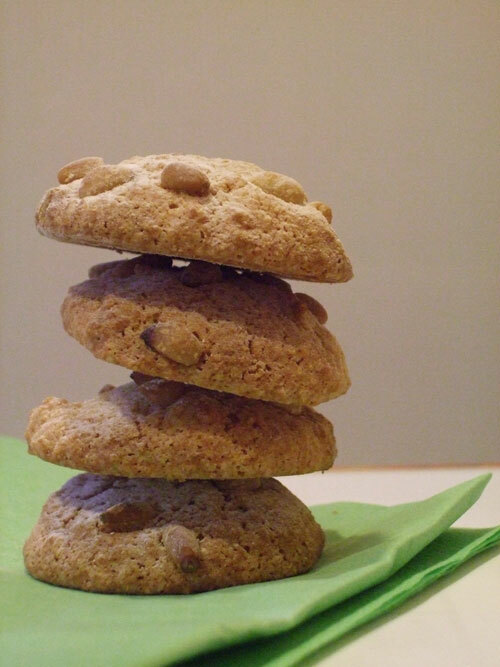 Pine nut and almond macaroons - one is never enough! Then a very fond memory swoops in, of a time I spent in Almería in Southern Spain, and the gorgeously simple macaroons I found at Almería’s favourite pastry shop. If you get a chance to visit Almería, seize it! It is a little jewel of a town, full of romance and the history of millennia (and a large helping of petty thievery – so keep a weather-eye open). It is right on the coast so you can swim away the extra calories you are bound to take on board while you are there - Almería has some wonderful places to eat. As the heat begins to fade from the day, the paseo begins. Crowds emerge and begin a stately promenade around the town. It is a chance to see and be seen. If you are a people-watcher, you could hardly get a better ringside seat than the pavement tables outside La Dulce Alianze, the 19-Century pastelería on Paseo de Almería. It is like a more refined and much smaller Bewleys of Grafton Street. You will be lured in by the stunning window display. An Aladdin’s cave of chocolates and pastries will call to you as you make your way to the stylish café area at the back. Resign yourself to the fact that you will emerge with at least a half-dozen prettily-wrapped sweetmeats (maybe these macaroons) to eat later. Meanwhile, here’s something to whet your appetite in advance of your visit. These little beauties make a light, slightly chewy treat during the festive season, and not a pink poodle in sight! 1 In a large mixing bowl (or food mixer) whisk the egg whites with the salt until the whisk leaves soft peaks in the mixture when you lift it out. 2 Mix in the caster sugar, ground almonds, plain flour and vanilla extract until combined. 3 Cover two baking sheets with ricepaper or non-stick baking parchment onto which you place teaspoonsfuls of the mixture about 5cm apart, flattening them slightly. You should get about 20 macaroons from this mixture. 4 Sprinkle 10 with pine nuts and 10 with flaked almonds, pressing the nuts lightly into the batter so that they stick. 5 Place in the pre-heated oven for 15 minutes or until evenly golden. 6 Transfer the macaroons – still on their backing paper – to a wire rack to cool. When cold, peel away the rice paper if that’s what you used (it doesn’t matter if some sticks – it’s perfectly edible) or carefully remove the non-stick parchment paper*. 7 Dust with icing sugar. These are wonderfully Christmassy and just the thing to accompany a cup of real hot chocolate. Tip: *If your 'non-stick' baking parchment sticks, don’t panic! Any paper that adheres is easily scraped away with a knife. These are a different macaroon than I'm used to. I LIKE IT! I'm partial to the coconut ones but, all the ingredients in yours are intriguing and I can't wait to make them myself! BTW--hooray for finding another Hester out there!!!! Love the pine nuts! Great addition to your macaroons. Pink poodle macaroons scare me but you're aren't the least bit intimidating! I feel like I could actually make these and enjoy them. Yummm! The pine nuts are a nice twist. These look so simple and so yummy. I've always wanted to visit Spain, especially the south, so these macaroons would be so fun to try. Yum! These are outstanding macaroons! The pine nuts really make them lovely and delicious! Got to make some and enjoy them too! Happy holidays!! !